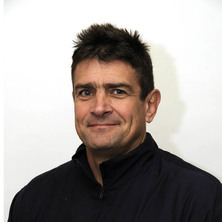 David Jenkins is an Associate Professor of Exercise Physiology in the School of Human Movement Studies; he joined the School in 1990 and has graduated 19 PhD and MPhil students as principal advisor. He has over 130 papers in peer-reviewed academic journals. Dr Jenkins has spent a number of years examining various aspects relating to the physiology of high intensity exercise and exercise nutrition. Jenkins, D. G. and Reaburn, P. R. Guiding the Young Athlete. Sydney: Allen & Unwin, 2000. Jenkins, D. G. and Reaburn, P. R. (2000). Protocols for the physiological assessment of rugby union players. In C. J. Gore (Ed. ), Physiological Tests for Elite Athletes (pp. 327-333) Champaign, Ill: Human Kinetics. Can anti-gravity running improve performance to the same degree as over-ground running? Are three contact efforts really reflective of a repeated high-intensity effort bout? Shing, C. M., Peake, J. M., Suzuki, K., Jenkins, D. G. and Coombes, J. S. (2013) A pilot study: bovine colostrum supplementation and hormonal and autonomic responses to competitive cycling. The Journal of Sports Medicine and Physical Fitness, 53 5: 490-501. Hunt, J., Marshall, A. and Jenkins, D. (2008) Exploring the meaning of, the barriers to and potential strategies for promoting physical activity among urban Indigenous Australians. Health Promotion Journal of Australia, 19 2: 102-108. Shing, C., Ogawa, K., Zhang, X., Nagatomi, R., Peake, J. M., Suzuki, K., Jenkins, D. G. and Coombes, J. S. (2007) Reduction in resting plasma granulysin as a marker of increased training load. Exercise Immunology Review, 13 89-99. Jenkins, D (2004) Role of a mixed type, moderate intensity exercise programme after peripheral blood stem cell transplantation - Commentary. British Journal of Sports Medicine, 38 3: 309-309. Laursen, PB, Shing, CM and Jenkins, DG (2004) Temporal aspects of the VO2 response at the power output associated with VO2peak in well trained cyclists: Implications for interval training prescription. Research Quarterly for Exercise and Sport, 75 4: 421-426. Laursen, P. B., Shing, C. M. and Jenkins, D. G. (2003) Reproducibility of a laboratory-based 40-km cycle time-trial on a stationary wind-trainer in highly trained cyclists. International Journal of Sports Medicine, 24 7: 481-485. Acute high-intensity interval training improves T-vent and peak power output in highly trained males. Paddon-Jones, D., Muthalib, M. and Jenkins, D. G. (2000) The effects of a repeated bout of eccentric exercise on indices of muscle damage and delayed muscle soreness. Journal of Science and Medicine in Sport, 3 1: 35-43. Hargreaves, M, McKenna, MJ, Jenkins, DG, Warmington, SA, Li, JL, Snow, RJ and Febbraio, MA (1998) Muscle metabolites and performance during high-intensity, intermittent exercise. Journal of Applied Physiology, 84 5: 1687-1691. Jenkins, D., Jordan, G., Desbrow, B. and Barnett, C. (1997) The influence of branched-chain amino acids on the glycaemic and insulin responses to a glucose solution consumed at rest. Australian Journal of Nutrition and Dietetics, 54 4: 187-189. Barnett C., Hinds M. and Jenkins D.G. (1996) Effects of oral creatine supplementation on multiple sprint cycle performance. Australian Journal of Science and Medicine in Sport, 28 1: 35-39. Bishop D. and Jenkins D.G. (1996) The influence of resistance training on the critical power function and time to fatigue at critical power. Australian Journal of Science and Medicine in Sport, 28 4: 101-105. Mackinnon, L.T. and Jenkins, D.G. (1993) Decreased salivary immunoglobulins after intense interval exercise before and after training. Medicine and Science in Sports and Exercise, 25 6: 678-683. Jenkins, D. G. and Quigley, B. M. (1993) The influence of high-intensity exercise training on the W(lim)-T(lim) relationship. Medicine and Science in Sports and Exercise, 25 2: 275-282. Jenkins, D. G. and Quigley, B. M. (1992) Endurance training enhances critical power. Medicine and Science in Sports and Exercise, 24 11: 1283-1289. Shing, C. M., Coombes, J. S., Jenkins, D. G., Peake, J. M., Suzuki, K., Okutsu, M., Pereira, R. and Stevenson, L. (2006). Effects of bovine colostrum supplementation on exercise performance and immune parameters. In: J. L. Durstine, Medicine and Science in Sports and Exercise: Supplement and Final Program. American College of Sports Medicine 53rd Annual Meeting, Denver, Colorado, (S75-S75). 31st May - 3rd June, 2006. Peake, J. M., Shing, C. M., Strobel, N. A., Ahern, S. M., Jenkins, D. G. and Coombes, J. S. (2005). Consecutive days of high intensity training and its effect on markers of oxidative stress in highly trained cyclists. In: K.-M. Chan, Proceedings of the 8th Congress of the Asian Federation of Sports Medicine. 8th Congress of the Asian Federation of Sports Medicine, Tokyo, Japan, (98-98). 11-13 May, 2005. Marshall, A., Hunt, J. A., Miller, R. and Jenkins, D. G. (2004). Measuring physical activity in urban Indigenous people. In: 18th World Conference on Health Promotion and Health Education Program and Abstracts. 18th World Conference on Health Promotion and Health Education Program and Abstracts, Melbourne, Australia, (). 26-30 April 2004. Gardner, A. S., Martin, D. T., Gulbin, J., Doney, G. E., Jenkins, D. G. and Hahn, A. G. (2003). Laboratory and velodrome sprint cycling power in female cyclists following 6 wks of training. In: K. B. Pandolf, Medicine and Science in Sports and Exercise Supplement: American College of Sports Medicine 50th Annual Meeting Abstracts. , San Francisco, USA, (S337). 28-31 May, 2003. Marshall, A., Hunt, J. A., Corowa, J., Miller, R. M., Jenkins, D. G. and Brown, W. J. (2003). Measuring physical activity in urban Indigenous Australians. In: T. Shilton, National Physical Activity Conference 2003 Program. Active Living - All Together Better, Fremantle, Western Australia, (39-39). 12th - 14th November, 2003. Laursen, P., Knez, W. L., Shing, C., Langill, R. H., Rhodes, E. C. and Jenkins, D. G. (2002). Relationship between laboratory measured variables and heart rate during an untraendurance triathlon. In: B. Abernethy, Journal of Science and Medicine in Sport Supplement: 2002 Australian Conference of Science and Medicine in Sport. Sports Medicine and Science at the Extremes, Melbourne, (108). 12-16 October, 2002. Laursen, P., Shing, C. and Jenkins, D. G. (2002). Reproducibility of a laboratory-based 40-km cycle time-trial on a stationary wind-trainer in highly trained cyclists. In: B. Abernethy, Journal of Science and Medicine in Sport Supplement: 2002 Australian Conference of Science and Medicine in Sport. Sports Medicine and Science at the Extremes, Melbourne, (39). 12-16 October, 2002. Laursen, P. B., Shing, C., Peake, J. M., Coombes, J. S. and Jenkins, D. G. (2001). The influence of short-term high intensity interval training on endurance performance in highly trained endurance athletes. In: Sports Medicine Australia 2001 Queensland State Conference Abstract Book. 2001 Queensland State Conference Sports Medicine in the New Millennium, Coolum, (). 23-25 March, 2001. Brickley, G., Jenkins, D. J., Green, S., Williams, C. A., Wishart, C., McEinery, M. and Doust, J. (2000). Metabolic responses to intermittent exercise using the critical power concept. In: , , (526-527). .
Engstrom, C. M., Walker, D., Buckley, R., Barnett, C., Jenkins, D. G. and Abernethy, P. J. (1999). Biopsy injury to vastus lateralis. In: Sports Medicine Australia 1999 Queensland State Conference: Abstracts. Musculo-Skeletal Injuries: Prevention, Management and Rehabilitation, Coolum, (). 1-3 May, 1999. Blanchard, M., Jenkins, D. G., Jordan, G. and Mackinnon, L. T. (1999). Changes in muscle and plasma glutamine concentration in response to high intensity exercise and dietary manipulation. In: Book of Abstracts - Fifth IOC World Congress. Fifth IOC World Congress, Sydney, (52). 31 Oct-5 Nov, 1999. Hiscock, N., Blanchard, M., Jenkins, D. and Mackinnon, L. T. (1999). Plasma and blood mononuclear cell glutamine concentrations after acute intense exercise. In: Medicine and Science in Sports and Exercise. American College of Sports Medicine 46th Annual Meeting, Seattle, WA, (S60-S60). 2-5 Jun 1999. Stephens, S. A., Osborne, M., MacKinnon, L. T. and Jenkins, D. G. (1999). The influence of acute dietary carbohydrate manipulation on 2000m rowing performance and metabolism. In: Book of Abstracts - Fifth IOC World Congress. Fifth IOC World Congress, Sydney, (114-114). 31 Oct - 5 Nov, 1999. Bogdanis, G. C., Nevill, M. E., Lakomy, H. K A, Jenkins, D. G. and Williams, C. (1996). The effects of oral creatine supplementation on power output during repeated treadmill sprinting. In: , , (65-66). .
Strong in the city: A multi-strategy Indigenous Health Promotion Project: Final Report. A comparison of the influence of two different 12 week resistance training programs on endurance performance in competitive female cyclists. The physical conditioning of the Brisbane Bullets:an action research project. Evaluation of strength and power development in professional rugby league in order to reduce incidence and improve management of lower limb injuries. Repeated High-intensity Exercise in Professional Rugby Codes. Post-operative outcomes of transphyseal anterior cruciate ligament reconstruction in skeletally immature patients using round-headed cannulated interference screw fixation.